Fifty years ago, a new course was introduced at HBS to provide students with a better understanding of the problems of starting and managing new businesses. The Management of New Enterprises, developed and taught by Professor Myles L. Mace, served the needs of World War II GIs eager to launch entrepreneurial ventures and make their mark in the business world. The course was one of many postwar curriculum innovations introduced under the leadership of Dean Donald K. David, and it was a significant departure from more traditional classes aimed at training managers to lead large, complex corporations. Yet the course attracted one hundred students in its first year and became a fixture in the elective MBA curriculum for two decades. The popularity of The Management of New Enterprises and of related courses developed in the ensuing years underscores an interest in entrepreneurship among HBS students and graduates that has grown sharply over the decades. Last year, more than 15 percent of all elective credits in the MBA Program were earned in the School's courses on entrepreneurship. Moreover, in recent surveys, over half of all alumni describe themselves as entrepreneurs. As you will read in this special Bulletin issue, our alumni have founded or helped to transform many important companies over the years. They have shaped the evolution of industries as diverse as cable television, microcomputer software, publishing, specialty retailing, investment banking, money management, direct marketing, consumer products, and consulting. Following Professor Georges F. Doriot's lead, our graduates have had a major impact on the venture capital industry, which in turn financed a revolution in semiconductors, personal computers, communications, and biotechnology industries where the newest generation of HBS alumni is helping chart the future. Due in part to the imagination and determination of these pioneers and to shifts in worldwide economic conditions, the very nature of general management has undergone dramatic change in the last half century. Business leaders in large and small companies alike now need to be versed not only in running the established enterprise but also in entrepreneurial action, which embraces change and seizes opportunities. To borrow a phrase from Professor Howard H. Stevenson, who has conducted groundbreaking research in this area at HBS over the last fifteen years, entrepreneurship is "the pursuit of opportunity beyond resources currently controlled." Given the dynamic forces at work in today's economy and the intensity of worldwide competition, the lessons of entrepreneurial management thus are relevant to and critical to the ongoing success of companies of all sizes. 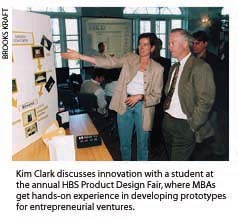 The time is right, therefore, to reaffirm the importance of entrepreneurship at HBS. To an extent that would probably astonish Dean David, entrepreneurial management has become an important focus of the School's research, course development, and educational programs. Over the last decade, under the leadership of Howard Stevenson, Bill Sahlman, and their colleagues, HBS has greatly expanded its commitment to this area. Our faculty have developed new ideas about launching and sustaining new ventures that have changed the way people think about identifying opportunity, creating resources, adapting to the unexpected, and managing creativity. Important empirical and clinical work in venture capital and private equity has shed new light on the structure, governance, and impact of the venture capital firm. All of this work has been linked closely to the development of a significant body of teaching material and the creation of new courses. There currently are six elective courses in entrepreneurial management in the MBA curriculum with combined annual enrollments of over 1,100. Seventeen faculty members are involved in teaching, research, and course development in this area in both our MBA and executive education programs. For a quarter of a century, our Owner/President Management Program has set the standard for educating entrepreneurial managers for leadership positions around the world. The Presidents' Seminar, offered in conjunction with the Young Presidents' Organization, is in its 44th year. The materials and courses our faculty have developed are widely used in entrepreneurship programs all over the world. Last year HBS Publishing sold some 175,000 cases in entrepreneurship as well as more than 12,000 books. More important than these numbers, however, is the strategy behind this creation of intellectual capital. In the fall of 1996 Entrepreneurial Management (EM) became an operating unit of the School with a mandate to build and grow. Like the eleven other major faculty units, EM is not only an important administrative unit but a community pursuing an intellectual agenda a place where we can attract and develop outstanding people and pursue new ideas, courses, and research around significant broad-gauged topics and problems. Our ability to attract outstanding faculty has been crucial to the group's success. Our strategy has been to build the Entrepreneurial Management team around full-time faculty drawn from diverse disciplines and perspectives. The wealth of backgrounds of its members facilitates this unit's ability to engage in intellectual cross-fertilization with other groups at the School. The size and quality of the group and our commitment to their work ensures a depth and consistency in our entrepreneurship teaching and research that is distinguished and distinctive. A s we reflect on the 50th anniversary of entrepreneurial studies at HBS in this special two-part Bulletin series, we celebrate the remarkable accomplishments of our many alumni entrepreneurs and the work of the HBS professors who helped to inspire them. With over 24,000 graduates who claim the title entrepreneur, it is impossible for us to share the stories of even a fraction of those who have distinguished themselves in this field. Nonetheless, in this series of articles we hope to convey a sense of the pervasive influence the School's entrepreneurs have had on our daily lives. This anniversary is also a time to turn our eyes to the future and to the promise of new generations. We are in a period of extraordinary opportunity at the School, matched by students with extraordinary ability and promise. It is our mission to build a lifelong partnership in learning that will enable them, as alumni, to continue to create and shape the future of enterprise worldwide.